Satan-speak, he declares, is full of bitter jealousy, selfish ambition, earthly concerns and desires, unspiritual thoughts and ideas, disorder, and evil. God-speak, on the other hand, is characterized by purity, peace, consideration for others, submission, mercy, sincerity, impartiality, and goodness. Do verses 9 and 10 describe your own mixed record of positive and negative speech patterns? Which kind of speech reflects your true identity? Which kind of speech serves as a sobering reminder of your basic sinful nature? Is it really possible to “take back” words spoken carelessly or in anger? What is the ultimate source (v. 6) of the poisonous words we utter? Does James’s verdict, in verse 8, mean that it is hopeless to attempt to control your tongue? What does his exclamation in verse 10 imply? What resource can we draw on in our battle to assert control of our tongues? Spend Time in Prayer: Ask God to change you from the inside out, by His Spirit increasing your power to monitor and control what you say. 2 Indeed, we all make many mistakes. 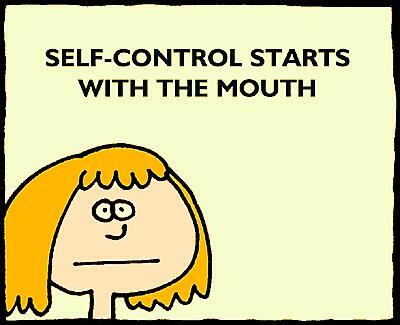 For if we could control our tongues, we would be perfect and could also control ourselves in every other way. 3 We can make a large horse go wherever we want by means of a small bit in its mouth. 4 And a small rudder makes a huge ship turn wherever the pilot chooses to go, even though the winds are strong. 5 In the same way, the tongue is a small thing that makes grand speeches. But a tiny spark can set a great forest on fire. 6 And the tongue is a flame of fire. It is a whole world of wickedness, corrupting your entire body. It can set your whole life on fire, for it is set on fire by hell itself. 7 People can tame all kinds of animals, birds, reptiles, and fish, 8 but no one can tame the tongue. It is restless and evil, full of deadly poison. 9 Sometimes it praises our Lord and Father, and sometimes it curses those who have been made in the image of God. 10 And so blessing and cursing come pouring out of the same mouth. Surely, my brothers and sisters, this is not right! 11 Does a spring of water bubble out with both fresh water and bitter water? 12 Does a fig tree produce olives, or a grapevine produce figs? No, and you can’t draw fresh water from a salty spring. Prayer for the Week: Teach me, Lord, what it means to have a Christ-like tongue. Check my tendency to tear others down; prod me to build them up. Fourteen men, including the pastor and elders, led a church’s weekly home Bible study/sharing groups. They met once a month for breakfast to compare experiences in their home groups and their own lives. The 14 became tight, helping each other grow in their leadership roles and personal qualities. But then, beginning with a couple of men, put-down humor crept in. This spread. Their motive—to connect and have fun with shared humor—was right. But humor, conveyed in a sarcastic tone and containing an element of truth, carries a bite. Sometimes they walked away wondering What did he mean by that? This injected suspicion and disquiet, and undermined mutual trust. During a church retreat, the Christian camp staff overheard, and became recipients of, this mocking banter. The camp director shared their concern with the pastor, who passed it on to the leaders. They discussed it as a group and agreed to put a stop to the practice. Unhindered by put-down humor, their friendships and sense of shared mission continued to deepen. And the entire congregation benefited from the cleared air. Down with Put Downs – Play the B.U.G. Key Bible Verse: Some people make cutting remarks, but the words of the wise bring healing. – Proverbs 12:18. You know the routine. You call one of your teammates a name, and your other teammates laugh. You may try to justify your unkind remarks with the fact that everyone does it, but the truth is that those reckless words cut. They pierce like a sword and cause damage. Instead of just going with the flow and drifting into the Cut Down Game, God desires us to play the B.U.G., or the Build Up Game. This game takes effort, and we have to be intentional to play. It doesn’t come naturally, either. But when it’s played, it’s awesome. The B.U.G. blesses so many people. A friend of mine once said that everyone in the world is under-encouraged. I agree! I ask the Lord to show me ways that I can encourage teammates, friends, family members, and even people I don’t know. I want to build others up and show love through my words. I believe that the tongue can heal. Are you ready to play the B.U.G.? My Response: Have I realized that my words can heal? Where could I start? Down with Put Downs – A Joke or a Jab? It’s the coward’s approach. It’s saying, I have an issue with my spouse, but I’m too chicken to bring it up honestly where I might face disapproval or anger. So I’ll come up with a joke, often in the company of other people, designed to hit at the heart of some tender area between us. Not long ago I was commenting on the fact that when our children were little they didn’t pull all the pots and pans out of the kitchen cupboards and play with them like so many toddlers do. I was wondering why that might be, and John responded that maybe it was because they’d never seen the pots and pans. One decisive husband we know loses no opportunity to jokingly tease his wife about being unable to decide how much salt to put on her salad or what dress she’s going to wear. Sadly, now their sons are also doing it. My Response: How have I teased others in a hurtful way? How could I be more aware? “Innocent” jests that inflict minor wounds have become accepted practice in every setting, from sporting events to church socials. We’re exposed to a culture of trash talking, one-upmanship, and a false masculinity reinforced by every macho stereotype in society. “Good afternoon, Mr. Phelps. It seems that a wild beast is loose in the dark regions of your mouth. It has the ability to spew acidic venom, causing the rapid breakdown of marital harmony. My Response: Does taming my tongue seem an impossible mission? How could I begin? As a young basketball coach I had a short fuse, especially when it came to dealing with men in stripes. It was hard keeping my mouth shut, and I often said things that got me in trouble. One game in particular, I thought my team was being treated unfairly and was quick to point it out. Late in the game, I stood up and yelled, “What? !” It was only one word, but the officials had heard enough. I got a technical foul that cost my team the game. Controlling the tongue is a problem for many coaches and athletes. Many times, we create more problems with our mouths than with our actions. Why? In my case, it was because I wouldn’t think before I spoke. Why does God want us to keep our tongues in check? When we speak before thinking, we usually do not honor Him with our speech. He would much rather we say nothing at all than speak too quickly. It’s the most difficult thing in the world to tame the tongue, but God’s Spirit living in us through the work of Jesus can help us think before we speak—even in the midst of challenging situations! My Response: What came out of my mouth the last time I was under pressure? Dan Britton is a senior vice president of the Fellowship of Christian Athletes, overseeing its camps and its campus, sport-specific, and coaches’ ministries. Both the Virginia high-school football and lacrosse teams he captained won conference and state honors. At the University of Delaware, he was the lacrosse team captain and a leading scorer. He then spent four years as a starter for the Baltimore Thunder. Carson Palmer, a Heisman Trophy winner and the number one NFL draft pick in 2003, signed a $49 million, six-year contract with the Cincinnati Bengals. $10 million of it was his signing bonus. However, that $10 million wasn’t contingent upon his great throwing arm, his intelligence as a quarterback, or his great play-calling. It was contingent upon his not saying anything negative about his team, coaches, or management. Basically the $10 million signing bonus was a loyalty pledge in which Carson guaranteed that he wouldn’t be critical. If he ripped into his team, he lost the cash. After someone has wronged us on the field or in the locker room, it’s easy to lash out. God desires not only for us to keep our mouths from cursing but also to keep them positive. The tongue is only a reflection of what is in our heart. When you’re under pressure, what comes out? Criticism or encouragement? You might not get paid $10 million for having a Christlike tongue, but your Savior will be glorified! Peter’s letters were written to encourage believers who would likely face trials and persecution under Emperor Nero. So he exhorted them to take the long view and focus on God’s salvation that would deliver them from the hostility of an unbelieving world. When were you included among those to whom God has bequeathed a “priceless inheritance”? What is the solid basis (v. 3) for your confidence that you will obtain this inheritance? What does Peter say (v. 4) is the advantage of having your inheritance reserved for you in heaven? What, according to verse 5, is your outlook for living now? And for the future? Why should you be glad now (v. 6) for joy that is still future? Some have ridiculed the believer’s hope as “pie in the sky bye and bye.” What is inadequate about the perspective of these critics? Spend Time in Prayer: Ask God to deliver you from the human tendency to a shortsightedness that overvalues the temporary and under-rates the permanent. 3 All praise to God, the Father of our Lord Jesus Christ. It is by his great mercy that we have been born again, because God raised Jesus Christ from the dead. Now we live with great expectation, 4 and we have a priceless inheritance—an inheritance that is kept in heaven for you, pure and undefiled, beyond the reach of change and decay. 5 And through your faith, God is protecting you by his power until you receive this salvation, which is ready to be revealed on the last day for all to see. 6 So be truly glad. There is wonderful joy ahead, even though you have to endure many trials for a little while. 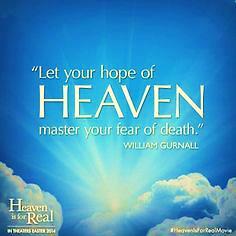 Prayer for the Week: Thank you, Lord, for the hope of heaven. Use it in my earthly life to inspire and sustain my passion and purpose. I thought, That’s a good admission—filled with hope. How could she turn that idea into the reality of liking to run? Run! Get out and do it. Start simple and build up an appropriate pace. Learn about the sport. Do it as a discipline until it becomes a joy. Soon you’ll be an avid runner. Some of us need to admit the same about God and His presence. “I don’t like the presence of God. If I did, I’d spend more time cultivating, acknowledging, and seeking it. But I like the idea of liking the presence of God. So I’d better make a start right now.” You don’t want to show up in heaven one day without maximum capacity to enjoy this God who wants to usher you into His very own happiness. Heaven is an acquired taste, and we’ve got to get ready for it now. Sarah’s question took me by surprise. My 11-year-old asked if her grandparents would be married in heaven. As I stumbled through a sophomoric answer, I began anticipating a place where sadness is consumed by joy. It’s hard to picture the new heaven and new earth, but I suspect there’ll be green and yellow tents and baseball mitts and countless opportunities for healing conversations. I imagine the homecoming feast described in the Bible will include families and stepfamilies spanning dozens of generations, celebrating a new home where all is set right. If you’re like me, you are skilled at ignoring this—going about daily business as if the matters of this mortal life deserve our full attention. Many of us work, raise children, get promoted, coach Little League, save for retirement, buy a house, travel, retire on a lake in the Ozarks, and life goes on. Or does it? Eventually it ends. My musings in response to Sarah’s question were founded on my Christian faith, which has come to shape the way I see everything. I believe we’re people with a future that will last much longer than our present bodies. On a balmy 1982 October afternoon, Badger Stadium in Madison, Wisconsin, was packed with over 60,000 University of Wisconsin fans watching their football team play Michigan State’s Spartans. It soon became obvious that State had the better team and would win. What was odd, however, was the seemingly unconnected and increasing eruptions of applause from the Wisconsin fans despite the mounting defeat. Why were they cheering as their team was losing? Many fans, it turns out, were listening to portable radios broadcasting another game in progress 70 miles away in Milwaukee, where the Brewers were beating the St. Louis Cardinals in game three of the World Series. They were responding to something they couldn’t actually see. Likewise, Paul encourages us to fix our eyes on the unseen. When we do, we celebrate even in difficulties because we’re tuned in to see God’s larger picture at work. Paul says a Jesus follower can live confidently because of the guarantee that God’s presence indwelling us carries. His power is available to us here and now! And we rest assured of a secure future. We are at home in either place—in our bodies or with the Lord. My Response: Am I really open to being at home in either place? D-Day and V-Day. Oscar Cullman, in his book Christ and Time, used an analogy from World War II to illustrate the believer’s current status. D-Day was when the Allied forces landed in Normandy and established a beachhead. The strategizing generals on both sides recognized that the outcome of the war was decided on that fateful day in June 1944. They understood that if the Nazis had driven the Allies back into the sea, they would have won the war. But because the Allied armies prevailed at Normandy, they sealed the eventual doom of the Nazi cause. But between D-Day and V-Day—marking the surrender of the enemy and the Allies’ liberation of all of Europe—there’d be many months of suffering and struggle. There’d be horrendous battles as the Allied armies, little by little, pushed back the Nazi forces. The Cross and the Resurrection were God’s D-Day. God in Jesus fought and won the decisive battle. Although Satan is raising havoc, his power has been broken, and Christ, through the church, is driving back the forces of darkness. God’s V-Day isn’t yet here. But because of God’s triumph on D-Day, we know how it all will end. My Response: How can knowing the final outcome give me an edge in today’s struggle? Sometimes I need to be reminded that as Christians seeking to expand the Kingdom of God in this world, our role is in Marketing, not Management, and that roll out and details of God’s divine plan are not subject to our knowledge or control. I’ve served as the Organist at Central Church for more than 40 years, and we have a temperamental, old pipe organ that requires ample measures of tender, loving care, as well as the occasional fine adjustment with a sledgehammer. Saturday nights are reserved for conducting a quick confirmation of the condition of the organ so any last-minute adjustments can be made before the Sunday worship service. That’s also the time that one of our recovery groups meets in the Fellowship Hall, so I usually try to wrap-up my weekly review upstairs in the Sanctuary while their advance guard is downstairs putting the coffee on to brew an hour or so before everyone arrives. Over the years, I’ve gotten to know some of the fellows who come early to set-up for the meeting, and I’ve invited one older gentleman in particular more than a few times to join us for Sunday worship. He’s never taken me up on my invitations, but I continue to make them. Last Saturday, after the organ review was completed, I moved over to the piano for a quick run-through of the Choir anthem. 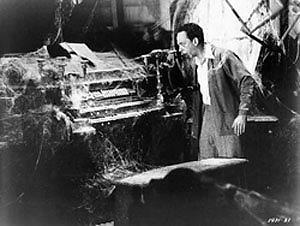 It was a beautiful arrangement that incorporated two old hymns, and, while I was playing, I heard the staircase creak. A few moments later, I saw the Sanctuary door quietly open out of the corner of my eye, and that older gentleman slowly made his way down the ramp into the Sanctuary, stopping behind me. Thinking that the combination of my repeated invitations and the heartstring tug of the old hymns had finally had an effect, I worked through the rest of the anthem with gusto. Peter, a fisherman like his biblical namesake, had been a doer of kind deeds and a practical joker, but he was no churchman. At his funeral, friends and family reminisced for almost two hours. By the time for my meditation, I calculated I had about four minutes before the crowd would lose interest. So, chucking my notes, I pointed to the three tables of photo albums and mementos laid out to represent Peter’s life. “So,” I said, “what is all this? Is this it? Is this Peter’s life? Is this what it distills to? “I don’t care what religion you belong to or would never belong to, what beliefs you profess or scorn. I’d bet a sweet purse that every one of you in this room has an instinct that is sharp as a razor right now. “The instinct is that this world isn’t big enough, long enough, deep enough to contain or explain even one single life in it. The instinct is that death, no matter how natural its causes, is always unnatural, a brusque intruder, a gloating enemy, and that death shouldn’t be allowed to have the last word. The instinct is that we weren’t made for this world only. We were made for eternity. This world isn’t enough. His passion is to take academically important public policy issues and make them intelligible and practicable to a wider audience. “Thanks very much,” I replied lightly. 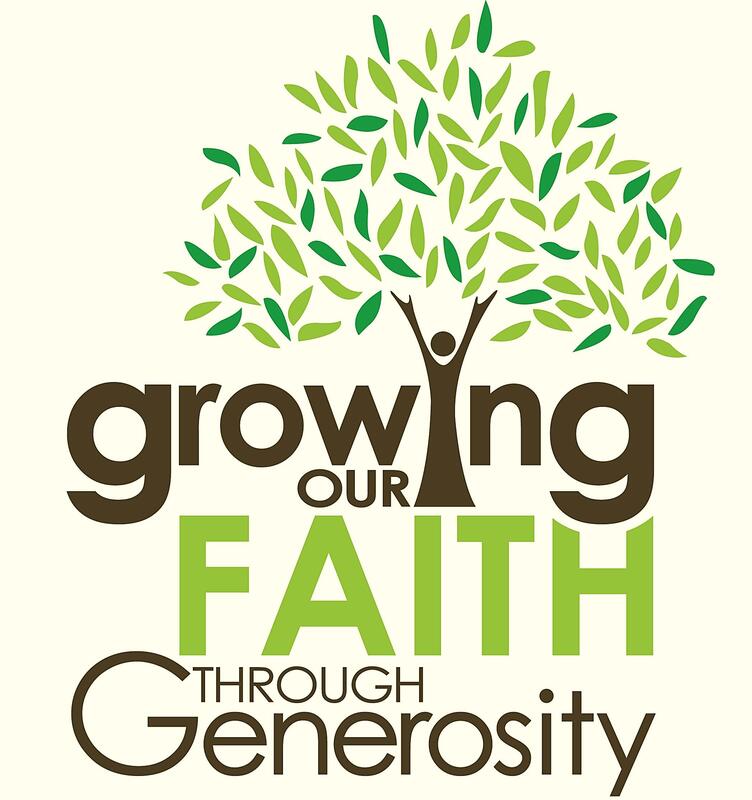 In today’s Offering is a check from the UMC GCFA for $53.85, bringing our total received to date from UMC Market to $153.85! An upgraded version of the UMCmarket program has now been launched with new features and an enhanced user experience. The General Council on Finance and Administration of the United Methodist Church is pleased to present UMCmarket, a tremendously rewarding opportunity to earn money for Central Church. UMCmarket makes it possible for our church to receive donations from retailers every time you make an online purchase. The best thing is that you don’t need to change anything from how you shop today, and every small donation makes a difference. This allows our church family to do together what we cannot do alone. You can easily sign up for free. When you go to http://www.UMCMarket.org, you will click on the “Get Started” button. You will have the option to sign up with your Facebook account or enter your email and create a password. You will then be prompted to download the Easy Give Button and find our church. With these three simple steps, you are ready to shop and donate! Using the Easy Give Button App is the easiest way for you to shop and donate. Once it’s downloaded, you will see the UMC Cross and Flame icon in your browser toolbar. This Easy Give Button will allow you to shop directly at store websites and let you know that you are connected. Research shows that members who download the Easy Give Button generate more than double the amount of donations to their church. You don’t have to remember to visit UMCmarket.org before you start shopping! Share UMCmarket with your friends! We hope you will sign up, try UMCmarket out, and share with our church family and friends. It’s easy and free, so why not rally your fellow members to do the same? See how fast your donations will make a difference! For help or any questions, UMCmarket’s customer service team is ready to help. Just email them at info@umcmarket.org. We live in a global village, and the world is our parish. When we give generously, our gifts do wonderful, life-changing things in the name of Jesus Christ. Because converts in the New Testament were undergoing intense persecution, many who’d come out of Judaism were tempted to escape the heat by reverting. The writer of Hebrews reminded his readers why their initial decision was still valid. If they patiently endured, he urged, it would build their character and lead to victory. But he realized their resolve was likely to founder if they tried to tough it out in isolation. Do you know a professing believer who is neglecting to meet regularly with one church family? Would you expect that this individual is holding tightly to his hope or beginning to waver? What are some ways in which the very act of meeting together strengthens the faith of those who gather? In what two ways can believers who meet together (v. 25) support each other? Brainstorm some ways you could do the kinds of encouraging singled out in verse 24. Why does the fact that we are getting closer to the day when Christ will return make regular involvement in a church family more essential than ever? Spend Time in Prayer: Ask God to provide you with a fresh impetus for growth from your church fellowship, and to help you determine how you can best make a vital contribution to your family there. 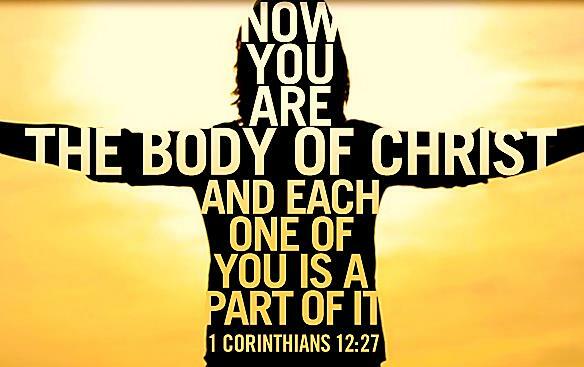 Prayer for the Week: In my community, Lord, help me to be a functioning part of Your body as You intend. a place off-limits to witches, demons, and the walking dead—the safest place in the world. We could call it church. But in these same communities, a sickness—the Church Hopper Syndrome—runs rampant. If you got personal and asked, “Where do you put down your spiritual roots? Where do you serve? Where do you give? Where do you invest yourself in the lives of others?” you’d probably get a confused stare. These people actually believe that the church exists to provide them with what they want from the experience. And that’s precisely why most are so miserable and empty! My Response: Am I a consumer of religious services or am I contributing to my spiritual community? Here is an interesting article on the advantages of giving by Howard Dayton from a recent issue of iDisciple. What are three advantages of giving when you keep in mind that you receive the advantages of giving only when you give out of a heart filled with love? Obviously a gift benefits the recipient. The church continues its ministry, the hungry are fed, and missionaries are sent. However, if a gift is given with the proper attitude, the giver, surprisingly, benefits even more. “Remember the words of the Lord Jesus, that He Himself said, ‘It is more blessed to give than to receive’” (Acts 20:35). The giver receives three extraordinary benefits. Above all else, giving increases our affection for Christ. The Bible says, “Where your treasure is, there your heart will be also” (Luke 12:34). This is why it is necessary to mentally give each gift to Jesus Christ. When you give your gift to him, your heart will automatically be drawn to the Lord. And nothing in life compares to knowing Christ well. Jesus wants us to know that when we give, we are investing treasures in heaven that we will be able to enjoy for all eternity . . . forever and ever! He told us, “Store up for yourselves treasures in heaven, where neither moth nor rust destroys, and where thieves do not break in or steal” (Matthew 6:20). Imagine that you’ve been offered a high-paying job for two years in Switzerland, but there’s a catch. At the end of two years, you have to leave behind all your Swiss currency and everything you’ve purchased. The only money you can keep is what you have converted to U.S. dollars and sent home. So what do you do with your Swiss currency? If you’re smart, you’ll keep only enough Swiss currency to meet your needs, and you’ll convert the rest to American dollars and send it home. Something similar to this will happen when you die—you’ll leave everything behind. And while it is true that you can’t take it with you when you die, you can send it on ahead! Paul wrote to some contributors, “Not that I am looking for a gift, but I am looking for what may be credited to your account” (Philippians 4:17). 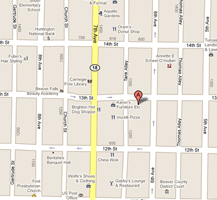 We each have an account in something comparable to the First National Bank of Heaven. Every time we give, we are making deposits to a heavenly account that is ours to enjoy forever. In addition to laying up treasure in heaven, there is a material increase flowing to the giver. The Bible says, “One gives freely, yet gains even more; another withholds unduly, but comes to poverty. A generous man will prosper” (Proverbs 11:24-25). Another passage about giving says, “Whoever sows sparingly will also reap sparingly, and whoever sows generously will also reap generously” (2 Corinthians 9:6). When we give, we should do it with a sense of expectancy—anticipating God to provide an increase even though we have no idea when or how he may choose to do it. In my experience, he can be very creative! Remember that you receive the advantages of giving only when you give out of a heart filled with love. This rules out the motive of giving just to get. Real Disciples Do Church – Nature’s Cathedral? When editor Charles Dunagin interviewed me for a reporting job in 1979, he asked what, if any, church I attended. “The church of the woods,” I retorted. He was unimpressed. I later learned that Dunagin was a churchgoer and a passionate quail hunter. Though well acquainted with the glories of nature, he knew that the outdoors is no substitute for church. Since then I’ve also become a churchgoer. Those folks who claim the outdoors takes the place of church don’t typically spend their outdoor time in worship. Back when I missed church during deer season, I was watching for antlers on Sunday mornings, not seeking spiritual instruction. The Bible praises the wonders of nature; and Moses, Elijah, and Jesus withdrew to the wilderness to commune with God—but not to the exclusion of His house. The woods can’t deliver what church offers. We experience a unique closeness with fellow believers as we praise God in song, communicate with Him though prayer, respond to His Word preached, and partake of Communion. But you’ll still find me camping out on several weekends each year. And I don’t think God will fault me for it. My Response: Does recreation or corporate worship have prior claim on my weekends? [continued from yesterday] My visits to the other church are exciting for a time. They do seem to have it all together. But soon the reality takes over from fantasy. The other church isn’t so perfect. The preacher isn’t adored by everyone. There is a grumbler’s club. They have budget shortfalls. It’s taken me years and countless mistakes to learn that no matter which church I’m in, people will be people and we all fall far short of God’s glory. We all need His mercy to survive another day. There is no perfect church. While I may enjoy friendship and fellowship with other Christians in other churches, I owe it to my church family and friends to stick with them for the long term, shoring up the foundations in my own congregation. There are legitimate and often painful reasons to leave a church and seek spiritual fellowship elsewhere. Many Christians have been forced to make that difficult choice, and rightly so. Too many of us look for a new church for the wrong reasons—out of boredom, discontent, and a desire to spark up what we ourselves have neglected, instead of sticking it out for the sometimes difficult but ultimately rewarding long run of church membership. My Response: How much time and effort have I put into enhancing my church? Real Disciples Do Church – Flirting? I was whining to a friend recently about church. I told him I was disillusioned. Little things were bugging me and worship had lost its spark. I felt numb, lifeless, and unfulfilled. “Well, why don’t you check out our Sunday evening service instead?” he replied. “It’s just your style.” My friend goes to another church and, in fact (gasp), another denomination. It sounded good. Craving something exciting and different had crept into my life. So I took him up on his offer and dropped by his little church. Fresh music, new friends, warm smiles, and a challenging message from a different kind of preacher—it was as refreshing as a cold drink on a hot day. The place was alive. I drove home tapping the steering wheel and singing one of their edgy praise songs. I had a rush of new hope. If that was what church could be like, I wanted to go back. Bob Hostetler isn’t your average pastor. He’s been a disc jockey, won repeated awards from the Associated Press for his broadcast writing, authored his own books, and co-authored 11 books with youth evangelist Josh McDowell (two received the ECPA Gold Medallion award). Bob and Robin live in southwestern Ohio and have two adult children. They have also foster-parented ten boys (“not all at once!” Bob clarifies). Many of us shop around until we find a church geared to meet our practical needs. It’s only normal to include these needs in an evaluation of a church and its ministries. We attend the church we select and eventually we join. Until something happens. The pastor fails to visit us in the hospital. Or Mrs. McKenzie in the nursery snaps at us when we’re late picking up our children. Or the church grows to a point where we don’t feel “at home” anymore. So we move on. We find another church. Until something happens there. We’ve bowed to the idol of individualism instead of committing to a community and staying faithful through good times and bad. Two factions of Israel’s religious leaders were temporarily allied in playing “stump the chump” with Jesus. First Jesus silenced the Sadducees. Then the Pharisees pitted their expert against Him. The Pharisees had classified more than 600 laws, often trying to distinguish the more important from the less important. So to their minds, the question their expert posed was luring Jesus into a quagmire. Do you think the Pharisees placed more emphasis on what people should do or what they shouldn’t do? Which aspect did Jesus emphasize? How can you love God as a person, not a mere force (See John 14:9 and 16:27)? What spheres of love are suggested by “heart,” “soul,” and “mind”? How does the word all restrict the way your love may be attached to other objects? In the second commandment, why is a person’s self-love taken for granted? How would displacing your self-love with God-love make it easier to engage in true neighbor-love? Spend Time in Prayer: Ask God to help you penetrate through daily responsibilities and church involvement to a personal encounter with Him. Prayer for the Week: When I feel driven and distracted, Your voice gets drowned out. Help me, Lord, to discover how to focus on Your presence in my life. At chapel yesterday with my friends from around the battalion, I eagerly anticipated the baptism of SSG Falcon, the soldier I’ve been discipling. I wanted this new beginning experience for him to be just right. We began the service with a hymn. This being Iraq, we get no guitar, keyboard, or drums. We have the chaplain standing in front singing. That’s it. As we sang, I noticed the dirt on the concrete floor, and that just about everyone was singing off-key. This isn’t how baptisms are supposed to go, I thought. But then I felt God’s gentle vise-grip of conviction on my heart as I began to see the service from His perspective. These 20 or so men weren’t concerned about making a show of worship or impressing people with their voices. They were here to be impressed with God, and to give Him their hearts. God isn’t into the song if the singer’s heart isn’t in tune with Him. He’s not pleased with a church’s “high-techness” if the focus isn’t His glory. He’s tired of people “worshiping” just to feel good, or to display their own abilities or creativity. God is serious about His people’s hearts. My Response: How reliant is my worship on program elements and surroundings? “Love God with all your heart” means: Find in God a satisfaction so profound that it fills up all your heart. “Love God with all your soul” means: Find in God a meaning so rich and so deep that it fills up all the aching corners of your soul. “Love God with all your mind” means: Find in God the riches of knowledge and insight and wisdom that guide and satisfy all that the human mind was meant to be. In other words, take all your self-love—your longing for joy and hope and love and security and fulfillment and significance—and focus it on God, until He satisfies your heart and soul and mind. You’ll find that this isn’t a canceling out of self-love. This is a fulfillment and transformation of self-love. This first commandment makes the second commandment doable. The second commandment no longer threatens to be the suicide of our own happiness. Instead, our inborn self-seeking—now transposed into God-seeking—overflows and extends itself to our neighbor. My Response: How can I begin to love God, and then my neighbor, as myself? One power tool in my arsenal is a belt sander. Its two rotating cylinders that drive a loop of sandpaper in a circular motion look a bit like a miniature Caterpillar track. The challenge is to keep the sanding belt in the middle of the track. The belt tends to slip to the right or the left, and eventually slides off the cylinders altogether if I fail to stop and make adjustments. So I end up sanding a bit, stopping to center the sandpaper, sanding some more, stopping, re-centering, sanding, and so on. Belt sanding isn’t a profound activity even for one who likes power tools. But it provides a useful metaphor for Christian spirituality. We slide off center, you and I. We need to stop and center ourselves in God’s presence over and over again. There are deadlines at work and bills to pay and children to taxi and all sorts of other distractions. The world tells us to speed up and step up and keep up. God whispers an invitation to slow down, to sit down, to center, to remember, to be bathed in grace and love and wisdom, to keep Christ as close as possible to the core of our lives. My Response: What adjustments would help me re-center on Christ? I once read that on average American children spend less than three minutes a day face-to-face with their fathers. Ever since learning that sad fact, I’ve made it a point not simply to spend time with my children, but also whenever possible to look them in the eye. This is how a father knows his children: by studying the subtle changes in their countenance. And this is how children know their father: by gazing upon his face, where they see the sternness of his rebuke and the tenderness of his love. There’s something metaphoric about this promise, of course, but we shouldn’t dismiss its literal dimension. When we get to heaven we’ll be able to gaze upon Jesus’ physical face. God has promised to show us His glory “seen in the face of Jesus Christ” 2 Corinthians 4:6. If only we knew our heart’s true desire, we’d know that His face is the one we’ve been looking for all these years, that seeing Jesus face to face will satisfy our deepest longings. My Response: How frequently do I carve out “face time” with my heavenly Father? Involved in a project, I was torn between doing something with my son and finishing my work. But after a brief debate with myself—A good Christian dad would spend time with his son versus Yeah, but work is important, too—I went out to our driveway with him to play basketball. Well, to be honest, my body went out there, but the rest of me was still down in my office working. I was embarrassed and quickly called the rest of me out of the office to join us. I gave myself to playing with my son, and the activity turned out to be a lot more enjoyable—for both of us. For days after that experience, God was teaching me something: If a ten-year-old boy knows when his dad’s heart isn’t in what he’s doing, you can be sure that God knows exactly how much of us is really involved in our acts of praise. He expects us to give it our all. Just going through the motions equals unacceptable worship. My Response: If worship is total self-giving, could I be counted among the worshipers last Sunday in my church? Centering Down – Out of Nowhere? Andy Stanley started out as a minister to students at First Baptist Atlanta in the shadow of his well-known father, Charles. But then, a dozen years ago, he, along with four others, founded North Point Community Church in North Atlanta. That congregation has expanded rapidly and now meets on three campuses. Andy has consistently mentored a young group of future leaders and Christian ministers, and has hosted conferences for leaders under 40. What He Said…Out of Nowhere? One summer in the late afternoon, I was walking along the beach by myself. The air was noticeably still. I remember thinking how odd it was that there wasn’t even a breeze. After walking for about a mile, I turned around to head back to the hotel and something strange happened. Suddenly there was a breeze. I didn’t feel it as much as hear it whistling in my ears. Where had it come from? It had been there all along. But as long as it was at my back, I didn’t hear or feel it. As soon as I faced the other way, my ears immediately sensed its presence. As long as we have our backs turned to Him—pursuing our own interests and desires, living life the way we think it should be lived—we remain unaware of His presence. Once we turn in His direction, beginning to prioritize our lives around His values and principles, it’s as if He comes alive to us. There’s a heightened sense of His reality. Apparently by prearrangement, a furnished upper room was provided to commemorate Israel’s escape from Egypt. Peter and John drew KP duty: buying and preparing the lamb, as well as the ceremonial food and wine. The absence of household servants may have been to assure privacy and security. When Jesus and the other ten disciples arrived, there was no servant to wash the guests’ feet. Why would Jesus be the last person expected to perform this task (see Luke 22:27)? How did washing His disciples’ feet show “the full extent” (v. 1) of Jesus’ love? Why do you think Peter objected to allowing Jesus to serve him in this way? What does this passage say about our willingness to serve others? If we decline to serve others, is there a sense (v. 16) in which we are claiming prerogatives that Jesus didn’t claim? How do you treat those who work under you (whether employees, volunteers, or children)? Why is a general willingness to serve (v. 17) not enough? Spend Time in Prayer: Ask God to make you alert to opportunities to serve, and help you discover the satisfaction that caring for the needs of others brings. 1 Before the Passover celebration, Jesus knew that his hour had come to leave this world and return to his Father. He had loved his disciples during his ministry on earth, and now he loved them to the very end. 2 It was time for supper, and the devil had already prompted Judas, son of Simon Iscariot, to betray Jesus. 3 Jesus knew that the Father had given him authority over everything and that he had come from God and would return to God. 10 Jesus replied, “A person who has bathed all over does not need to wash, except for the feet, to be entirely clean. And you disciples are clean, but not all of you.” 11 For Jesus knew who would betray him. That is what he meant when he said, “Not all of you are clean.” 12 After washing their feet, he put on his robe again and sat down and asked, “Do you understand what I was doing? 13 You call me ‘Teacher’ and ‘Lord,’ and you are right, because that’s what I am. 14 And since I, your Lord and Teacher, have washed your feet, you ought to wash each other’s feet. 15 I have given you an example to follow. Do as I have done to you. Prayer for the Week: Lord, please motivate me to reflect Your compassionate heart to hurting people around me. God’s Love Demonstrated – Retreat or Rally? In the fall of 2003, four independent fires raged through the Los Angeles area, with nearly 3,000 acres burning. One fire reached Valley Center, devastating scores of families and homes. Two families lost loved ones. Those who lost their homes had no fallback position. On the Saturday following “containment” of the fire, the men of Ridgeview Church decided to help out. Instead of heading to the mountains for their annual men’s retreat, they stayed in Valley Center and spent the day cleaning scorched homes. The ensuing rains brought flooding, with erosion and mudslides. The men stayed to help with that, too. More than 100 men gave this desperate community about 1,000 man-hours and thousands of dollars’ worth of supplies, equipment, and skill. The people of Valley Center responded with profound gratitude for the help they received from the men of Ridgeview Church that Saturday. But Sunday morning said it all. Ridgeview Church was packed and filled with excitement. And over the coming weeks, many in the community kept coming back to learn more about Christ’s awesome love for them. We make the greatest impact for Christ when words come packaged with deeds. My Response: Was canceling the men’s retreat a godly decision? Why? I was impatiently standing in line at the grocery store on a brutally frigid evening, anxious to get to my warm home for dinner. But the line wasn’t moving. I waited and waited. I shifted my weight. I sighed loudly. I muttered under my breath. Still no movement. What was taking so long? Was the cashier a trainee? Was some customer chattering away to her? My blood pressure was rising fast. Finally I looked at the head of the line to see who was daring to delay me—and I saw a tiny elderly woman slowly and painfully pulling dollar bills out of her wallet in slow motion, her hands red and raw and stiffened by the icy weather. She could barely move her fingers. Apparently she had walked to the store in the subzero weather. This is what I’ve found: the Golden Rule becomes the most natural response in the world once you see life from the other person’s POV. My Response: Whose POV is God wanting me to see?